"Wow... I just found this blog after ~10 years of playing the BDG! I will have to read all your posts from scratch - a very interesting resource indeed. A couple of questions for you Rev. 1) I was thinking about purchasing one of your keybooks, so which keybook should I buy? 2) Also, I wanted to ask if you recommend/play the Hubsch Gambit yourself - I have never had much success with it when trying to transpose into the BDG, I am perhaps playing it incorrectly. Which keybook might help me with this? Best regards and keep up the great work!" Glad you found my blog! Thanks for the kind comments and for reading the blog. Tell you chess friends! Now to answer the questions. 1. The best keybook for early transpositions is my original BDG Keybook by Thinkers' Press (Bob Long). The best overall keybook is the Blackmar-Diemer Gambit Keybook II by Pickard & Son (ChessCentral.com). Please note however that all four of my books have sold out. Any copies you find are likely to be used. 2. 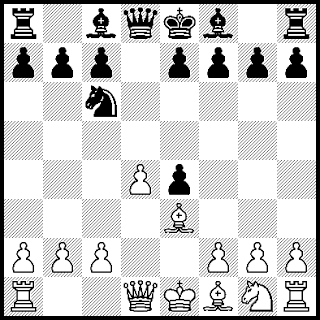 The Huebsch Gambit (1.d4 Nf6 2.Nc3 d5 3.e4 Nxe4) is a tough nut to crack. Traditionally I have preferred 2.f3 d5 3.e4 dxe4 4.Nc3 reaching a BDG that way. However, having a pawn on f3 is not to everyone's liking. The mainline vs the Huebsch Gambit is 4.Nxe4 dxe4 5.Bc4. In order of popularity, the most common five defenses here are 5...Bf5, 5...Nc6, 5...e6, 5...g6 and 5...Qd6. About 90% of the time these moves are chosen. Consult your favorite chess engine on where to go from here. The Huebsch is comparatively rare in my own games with humans. Beyond the main line of 5.Bc4, 5.Be3 seems to be a good choice. It is what I am trying this year. The idea is to connect the R/a1 with the Q/d8, strengthen d4, and follow-up with f2-f3 exf3 Nxf3 in basic BDG style. Sometimes it works well. For other ideas, the immediate 5.f3 has generally done well. Also tried are 5.Bf4 covering e5 and 5.c3 protecting d4 and preparing Qb3 or Qa4. Here is a Huebsch Gambit that I played vs a "paj" rated 2864. It didn't need all those points, though. One of the problems I have with the BDG is that precise knowledge is very helpful in getting a good game vs strong defense. I forget the exact lines sometimes.